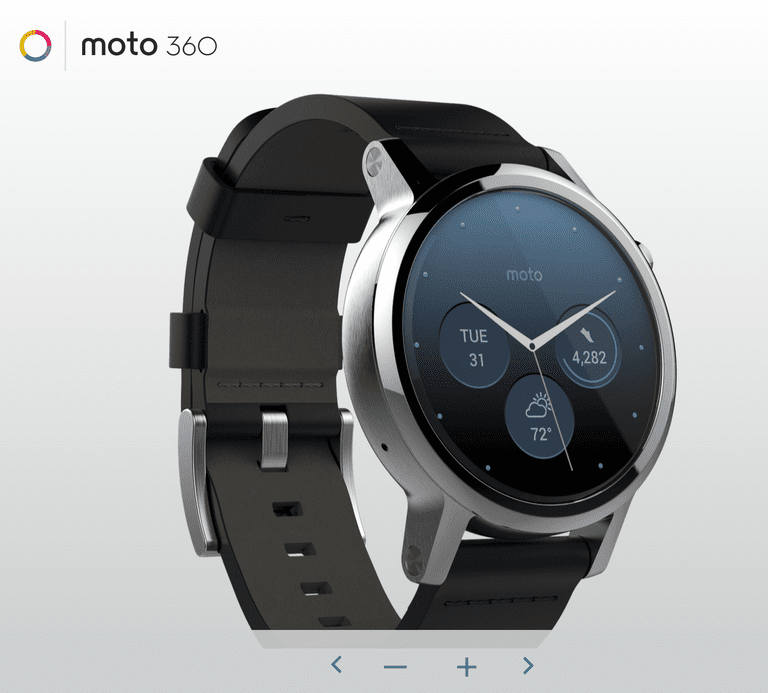 The Moto 360 smartwatch, like the Moto X Pure Edition smartphone, is fully customizable. Using the Moto Maker online tool, you can choose between a women's model, designed for small wrists and two sizes for men (42mm and 46mm.) I do not have small wrists, so I opted for the men's 42mm, with a leather band and a silver bezel and clasp. You can also opt for a metal band (men's) or a double-wrap leather band (women's). The only other wearable I've used before this is the Fitbit Flex, which is super light and almost unnoticeable after a day or two; the Moto 360 took some getting used to since I haven't worn a watch regularly in quite a long time. What I didn't notice right away is that the watch band can be interchanged. I was able to remove the band with ease, though fitting it back in was a little tricky. This means you can keep using your smartwatch even if your band is damaged and you can buy multiple colors to match your outfits. The watch comes with small wireless charger. When you place the watch in on the charger, it displays the time and the battery percentage. If you charge the watch overnight, you can then use it as an alarm. Setting Up the Moto 360You can pair the Moto 360 with an Android smartphone, such as phones made by Samsung, Google, Huawei, or Xiaomi, or an iPhone. All you have to do is turn on Bluetooth and download and open the Wear OS (formerly Android Wear) app. Then you'll see compatible apps on your watch, such as Google Maps, Moto Body, and even Duolingo. The watch also has a built-in flashlight, which is handy. When you lift up your wrist to look at its face, the Moto 360's display automatically turns on, which is nice. Another way to get at a glance information is with Live Dials. You can create widgets for battery life, weather, and fitness information, such as number of steps you've taken. Third parties, including Shazam, have created their own Live Dials. You can use wrist gestures to toggle through notifications on the watch, and while it worked most of the time in my tests, I found it a bit clumsy. I prefer to interact with the screen. I wish the watch could track other activities like biking, rather than having to use a third-party app like Endomondo, which has to be turned on and off. You can interact with the watch using voice commands the same way you can with an Android smartphone. You can dictate emails and text messages, get walking, biking, or driving directions, and ask questions, by saying "OK Google," followed by your command. Disclosure: Motorola provided me with a Moto 360 smartwatch at no cost. Do you have a Moto 360 or other Android-powered wearable? Let me know on Facebook and Twitter.